Welcome to Radio Ecoshock, a voice for science and truth, no matter where they lead. Later in this program we’ll reveal the good and bad news about the growth of alternative energy around the world. We go to Stockholm to get the latest from a new United Nations report. But first we need to tackle a gnarly problem: the marriage of big oil and coal money to large fundamentalist churches in the United States. It appears climate denying preachers are a roadblock to climate action in America. In America, a powerful group religious leaders have declared war against environmentalism and climate science. Allying themselves with Republicans and backed by oil company money, they tell millions of followers that more carbon dioxide is good for the planet. There is a counter-movement of Christians who embrace reality and science. Chief among them is the Reverend Michael Dowd. He’s the author of “Thank God for Evolution: How the Marriage of Science and Religion Will Transform Your Life and Our World”. Michael speaks to congregations across the U.S., as a preacher travelling with his wife, author Connie Barlow. Rev. Michael Dowd is currently part of the Great March for Climate Change. He’s an author, speaker, and often writes in the Huffington Post. Connie Barlow wrote 4 books on biology. She says she was blind-sided by the immediacy of climate change, thinking of the long time changes in past mass extinctions. She founded the group Torreya Guardians to help save this endangered Florida conifer. Michael has just written an article accusing big-time fundamentalist preachers as barriers to American climate change action. E. Calvin Beisner from the Cornwall Alliance says more carbon dioxide in the atmosphere is good for us and good for creation. Media figures like Glenn Beck agree. It seems like madness to me. Michael Dowd writes “According to recent polls, despite overwhelming evidence to the contrary 46% of Americans still cling to the idea that we live on a ‘young earth’ and 41% believe that we are in the ‘end times’, creating a critical mass of voters whose representatives are blocking urgent legislation on climate change.” Those are tough numbers to overcome, aren’t they? The big project now is “The Great March for Climate Action“. This is not a religious movement, but has the support of many churches as well. Check out the Great March web site to see when it gets near you. Can you be part of the March? I hope so. “Connie and I will rarely be walking with the marchers. Rather, we will be speaking in churches, colleges, and other venues along their route. Our role is to rally citizen support to press for changes that will reorient the incentives of American industries and consumers toward a sustainable, green-energy future. 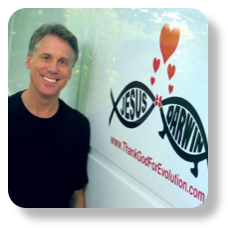 Michael is author of Thank God for Evolution: How the Marriage of Science and Religion Will Transform Your Life and Our World -Viking Adult (June 19, 2008. Find more about the book here. Follow Michael Dowd at his web site, and on Facebook. Learn more about the books of his wife Connie Barlow here. His 2009 TEDx talk “Why We Struggle and Suffer” is found here. In our Radio interview, Reverend Dowd was reticent to tell us exactly who among the religious right claim environmentalism is a dangerous enemy, and that global warming is exaggerated and good for us. After all, he meets many from those churches, and hope to bring them around. I think it’s important to know who used Christianity in the service of fossil fuel corporation profits. Let’s name names in this hate movie “The Green Dragon”. …and of course the hostess for the film, Janet Parshall. On her radio show, for example, one of her guests was Mark Musser, author of “The Nazi Origins of Apocalyptic Global Warming Theory”; “Green Lebensraum: The Nazi Roots of Sustainable Development” and other such books. That was on May 6, 2012. Find out more here. We can add to this list the Canadian educated professor of Physics and Computer Science at Presbyterian College, James A. Wanliss. He’s the author of the book “The Green Dragon: Is Global Warming a Religion”, and a second book published by the Cornwall Alliance titled “Resisting the Green Dragon: Dominion Not Death”. also hurt the oil companies and fossil fuel magnates who funnel large amount of money into their foundations and causes. They accuse the greens, who have been far from power, of trying to take over the world. That’s laughable, when we consider the wealthy 1% are always trying to take over the world, if they haven’t already. Second, these ministers, who demand total obedience from their flocks, right down to denying a scientific education to their children, call environmentalism a cult. Who are the cult leaders here? are almost entirely negative. Viewers reject this as the nonsense it is. Only the true believers will accept anti-science, and even in this film they admit their young leave the church, never to return, as soon as they become adults. Is this a dying gasp of older white folks, mostly white men, clinging to the fossil age? If you don’t mind getting mad, check out the Green Dragon promo on You tube. Or watch the whole awful 12 minute trailer here. Finally I say this to any parents whose pastor or preacher tells them global warming science is not true, or still uncertain. How can you not speak out for your children? How can you let authority deny them a safe climate to grow up in, the patterns you and your ancestors depended upon? I hope mothers at least, if not fathers, will tell such religious leaders that Hell on Earth is not worth anybody’s profits or positions of authority. The God of love would never approve of wrecking creation for a buck. As Reverend Dowd says, God is not a terrorist. Please keep in mind, I am not bashing Christianity here. There are plenty of climate leaders who believe deeply. Bill McKibben founder of 350.org is an elder in his Church. South Africa’s Bishop Tutu has spoken out against climate change. The two most recent Popes have call climate distruption a “sin”. The last Archbishop of Cantebury was very outspoken for climate action. Many churches are spearheading the move out of fossil fuel investments, and corporate responsibility. We need the support of good Christians to help stop this fossil fuel juggernaut. But the Christian climate deniers need to be called out. Others have tracked the trail of oil wealth, from Exxon/Mobil to the Scaife family, pouring money into front groups like the Cornwall Alliance and the Committee for a Constructive Tomorrow or (CFACT). CFACT received $542,000 from ExxonMobil, $60,500 from Chevron, and $1,280,000 from Scaife family foundations, whose money came partly from Gulf Oil. The head of the Cornwall Alliance is on the Board of CFACT, and they all share the sam eoffice in Virginia. Find more about all this from the Climate Progress blog. Right Wing Watch continues to watch these Green Dragon participants/conspirators here. Here is another good piece on the whole Green Dragon ploy by fundamentalist churches and their corporate backers. That is a great expose on this whole Green Dragon play, written by a group called Right Wing Watch. Look for the report “The “Green Dragon” Slayers: How the Religious Right and Corporate Right are Joining Forces to Fight Environmental Protection”. And that’s just the tip of the iceberg. Who knows how many millions have poured into fundamentalist churches and their schools from wealthy oil and coal men and their well-hidden foundations? These are the lobbyists who work connections in the Tea Party, in the Republican Party, and in State Legislature to gut environmental regulations, to deny climate change, to even pass laws outlawing any provisions or preparations for climate change. I have to say it: they are traitors to our children, the future, and all species. And so far, they appear to be winning. The Guardian newspaper reported last week, a leaked advance copy of the next IPCC Working Group Three concludes: greenhouse gas emissions grew nearly twice as fact in this new century, from the year 2000 to 2010, as in the previous 30 years. The economic troubles did not slow down that outpouring of carbon pollution. Every year of delay kills more species, kills more changes of living in a world worth living in. As the retired professor Guy McPherson reminds us there is about a 30 year delay in the full impact of greenhouse gases. The serious disruption we are experiencing now, all around the world, is from emissions in the 1970’s and 1980s. We know this for a scientific fact. That means we are already assured of worse to come, from our accumulated and even higher emissions so far this century. All that will strike humanity in the 2020’s and 2030’s. With the combined positive feedback effects already triggered, things like melting permafrost, Greenland glaciers, Arctic methane, dying forests, we may already be beyond the point where human intervention can save us. Nature’s great wheels of a massive climate shift appear to be already engaged. There are things we can do. We can probably prevent the climate from soaring up 6 or 8 degrees Centigrade within the lifetimes of the young now on Earth. We can probably still prevent total disaster unfolding over the next century or two. We can certainly begin to prepare a civilization flexible and sustainable enough to maintain a human social life, and preserve many of our fellow species. We can do that. The United Nations Environment Program, UNEP, has just released a report on the growth of renewable energy around the world. It’s good news and bad. The UNEP report is called “Global Trends in Renewable Energy Investment 2014”. It was launched in the second week of April. Eric Usher is responsible for renewable energy and sustainable energy finance for UNEP’s Division of Technology, Industry and Economics. To get the latest, we reached him in Stockholm, Sweden. According to the report, investments in renewables went down in 2013 despite our hopes and all the hype. But the better news is that is partly because of a steep fall in the cost of solar panels. Even better, “renewables account for 43.6% of year’s newly-installed generating capacity”. “Frankfurt / New York, 7 April 2014 – Renewable energy’s share of world electricity generation continued its steady climb last year despite a 14 per cent drop in investments to US$214.4 billion, according to a new report released today. According to Global Trends in Renewable Energy Investment 2014 – produced by the Frankfurt School-UNEP Collaborating Centre for Climate & Sustainable Energy Finance, the United Nations Environment Programme (UNEP) and Bloomberg New Energy Finance – the investment drop of $US35.1 billion was partly down to the falling cost of solar photovoltaic systems. The other main cause was policy uncertainty in many countries, an issue that also depressed investment in fossil fuel generation in 2013. We discuss the burst of renewable energy in China. They started making solar panels and wind machines on a huge scale for export. As export markets fell in tougher economic time, more Chinese sustainable energy production was applied in China itself. I was surprised at some of the countries who spent more on renewable energy. They include Canada, Chile, Israel, and New Zealand. Japan’s investments in alternative energy went up an astounding 80% following the shut-down of their nuclear reactor fleet. Perhaps there was a small silver lining to the radioactive cloud that is the Fukushima nuclear disaster. Find a brief summary of key findings, and other links to follow up on thie UNEP report here. Now its even easier to cruise Radio Ecoshock shows, and pass them on. Just search Soundcloud.com for Radio Ecoshock. You can listen to programs and music. It’s easy to share the audio with others, through any medium, including Facebook. Embed the audio in your blog. Please help get the word out using our new SoundCloud platform. Of course all our past programs are ready for listening, downloading, or pass on the link, and our web site at ecoshock.org. You can get a weekly reminder of each show via @ecoshock on Twitter, or have every program sent to you automatically via the Itunes Podcast. Find a handy podcast button at ecoshock.org. We’ll need it all, to get real science out there, plus answers from activists and leaders in safer alternative lifestyles. This show has no advertising budget, and no promotion department. That’s where you can help. Call it online evangelism, call it education about reality, but please pass on this show and blog as far and wide as possible. Radio Ecoshock is produced with a Creative Commons copyright. You can use it for anything except selling the audio or print to make money, or to promote a product. Other than that, feel free to use interviews or excerpts in your podcast, your online show, your low-power radio station, your blog – whatever. After all, we are trying to save the world. The world uses 25.000 megawatts of power. How many million of tons of batteries will we need to run the world on just renewable? To solve the climate problem, we would have to destroy the ecology. Whenever I hear about the solar "success" of China, Germany and Japan, I am struck by the omission of how much more these countries are relying on coal and gas. Just because I am pro-green doesn't mean I am pro-fantasy. Conservation and efficiency only results in more economic growth. Here is the dark side of "Green" energy. The manufacture of 5, one-megawatt, wind turbines produces 1 ton of radioactive residue and 75 tons of hazardous waste water used to extract and process the needed neodymium. Neodymium is a rare earth mineral. Rare earth minerals are not rare, but they are found in very low concentrations. Neodymium is extracted from crushed rocks using sulfuric acid, hydrochloric acid and sodium hydroxide. Then it is processed using solvents, heating and vacuum techniques that require plenty of coal power. Vast unregulated tailings ponds of poisonous water have destroyed whole villages in China. There are 16 other rare elements. All with the same story. There is no known replacement for neodymium. During its mining, metals such as arsenic, barium, copper, aluminum, lead and beryllium are released into the air and water, and are toxic to human health. Neodymium is only one of many rare-earth metals that our smart phones and green energy systems need, and Canada is making efforts to mine them right now. While neodymium is not used in very small wind turbines, can you imagine how many small windmills would be needed to run a huge city like Toronto? Each solar panel requires 4 tons of coal to manufacture them because the required silicon has to be baked for some time at 3,000°F. The manufacture of solar panels lets off some of the deadliest greenhouse gases known to humankind. These include hexafluoroethane (12,000 times stronger than CtO2), nitrogen trifluoride (17,000 times stronger than C02), and sulfur hexafluoride (23,000 times stronger than C02). Solar manufacturing plants produce 500 tons of hazardous sludge each per year. This sludge is never included in the solar industry carbon footprint data. All shiny new electronic things are super-poisonous and deadly serious for all life on earth. Bio-fuels are ecologically unsustainable. The crop mono-cultures are biodiversity deserts that increase soil erosion and have a myriad of unexpected consequences. Stand in a corn field and you will see nothing lives there, not even bees. 95% of food comes from just 30 crops. Food supplies are at risk going forward. We can't cut trees for cars when people starve. Our foods and animals already dominate the planet. We are earth's most invasive predators ripping all life's diversity from her loins. The rechargeable batteries we use in everything from the Tesla Electric Car, and Prius Plug-In Car, down to our smart phones, all rely on one critical component―graphite. Graphite is one of the main causes of the terrible air pollution in China. It comes from airborne particles given off by mining operations and often washes down from the sky with the rain. Graphite particles foul the air and water; they also damage crops and human lung tissue. This type of smog has gotten so bad that China has shut down several of their graphite mines, creating a shortage and higher prices. Right now, Algonquin natives in Kipawa, Quebec are fighting Toyota over a rare-earth open pit mine planned for that area. Toyota wants that mine pit to make the batteries for its Prius. There is no such thing as a “green” car. Concise and valid post by Robert C – absolutely on point, and reflective of the brilliance in Ozzie Zehner's "Green Illusions" book of last year. Alex's shows have been great, and he has a right to choose whoever strikes his fancy. This preacher was obviosuly good on the need to be science-based, and he may be a fine and hale fellow, but his spiel that "reality is God, God is reality" is just preposterous. He can deliver this TED-talk Christianity to polite and dutiful crowds, and good for him for attacking the fundies, but I have no idea what he is trying to say with the "divine" and the "sacred" and that find/replace fakery "God/reality." "reality is God, God is reality" is just preposterous. I turned off the podcast as soon as a "preacher" was the guest. Anyone with Father, Mother, Reverend, Ajjan, Swami, etc is in a cult, and reason is only convent when it doesn't get in the way with dogma. But, we live in the USA, and 85% of people believe in a Psychopathic Sky Daddy that one has mental telephony with. So reason and reality are not possible. I think this is a fantastic article and I am a Christian. You (the man in the comment above me) are rude and naive saying such things. Just because someone believes in the "psychopathic sky daddy" doesn't mean we are all as ignorant as you. As to Robert I appreciate you posting that information I had entirely no idea that what we call "green" energy is actually not so green! Quite a shame however. There was a wonderful poem / prose piece at the end of this episode, "I danced into the night". Could you point us to the source of that piece? Thanks. I wrote the little poem that went with the music.